Groundbreaking television journalist Barbara Walters has built a career on asking the right questions at the right time—a facility she attributes in large part to her Sarah Lawrence education. To honor her alma mater, Walters earlier this year made the largest single donation in the College's 89-year history. Her $15 million gift will help create a new campus center embodying Sarah Lawrence's commitment to what former Dean of the College Jerrilynn D. Dodds calls "the convergence of living and learning." 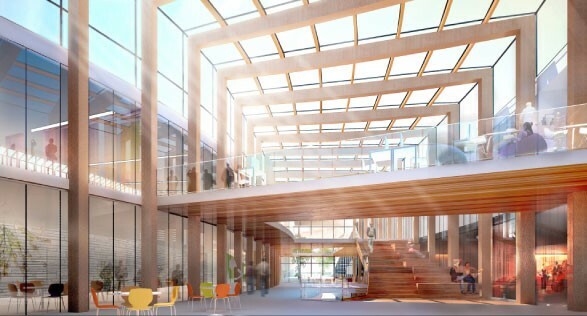 The Barbara Walters Campus Center will offer ample room where students and their teachers can extend their intellectual discourse beyond the classroom, serving as the hub of student life and the campus community. It will bring together the academic, creative, and social aspects of campus life, becoming, in the words of President Karen R. Lawrence, "a powerful magnet on campus, with gathering spaces large and small, in which community will flourish."